Weight: 1.06 ct; size: 7.64 | 6.50 | 4.75 mm; shape: oval; colour: light orangey yellow; strong; clarity: eye clean; cut: excellent; treatment: none. Very clean specimen; design ‘Ovalimixtum’, excellent cut by Tan Pen. A yellow to yellow-orange or yellow-green variety of quartz. 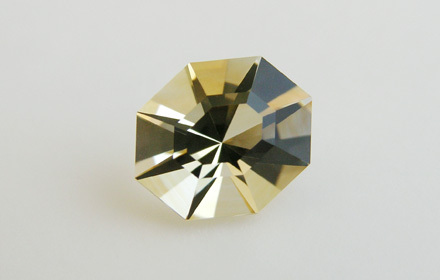 Natural citrine is very rare. Large quantities of amethyst, usually of lesser quality, are heated to turn it yellow or orange and sold as ‘citrine’.